A paradigm shift occurs when a person or a group of people have a fundamental change in their underlying assumptions about the world. The story of Anna and Geoff Martin has a deceptively routine beginning. They met in college and quickly fell in love. She was studying to become a dietitian, and he was working in a lab sequencing DNA at the University of Washington. However, after becoming sick from the fumes in the lab and weary of his work, they knew they needed a change. Looking over a portion of the farm. Always the type to take the road less traveled, the two packed up their VW bus and headed out on a transformational journey that eventually landed them in Oregon. 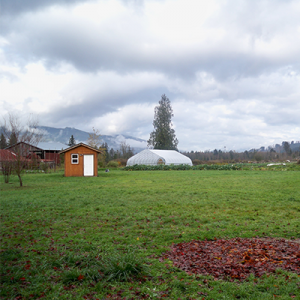 Here they learned about permaculture – a system of growing food wherein plants, animals, and landscape features work together to make the most use of the land and its resources – before returning to Washington. 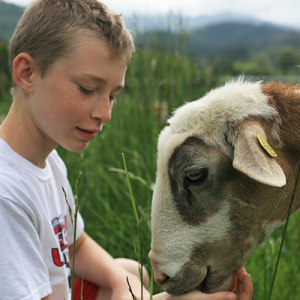 They had fallen in love again, although this time it was with sustainable farming. At a time when “organic” was a word used almost exclusively by chemists, the Martins were at the forefront of a revolution, with a goal of transforming the way food is produced. The family eventually found land of their own in Acme. Nestled between the foothills of the Cascades and the South Fork of the Nooksack River, the word picturesque doesn’t do it justice. For nearly 20 years, they have used their fertile soil to grow mixed vegetables, chickens, and eventually…their 3 children Oli, Clover, and Kyler. Anna and Geoff enjoy the work, but readily admit it’s a taxing endeavor. Between field work, running a business, and raising a family, there’s not much time for rest. The time spent together is worth it to them, though. Even distant memories of working in the fields and applying for bank loans with a child on her hip evoke a wistful grin from the matriarch. It truly is a labor of love. Along with the farm, they operate a chicken processing facility. Farmers as well as urban chicken keepers can have their birds humanely slaughtered and processed, and even participate. “The butchering component is what keeps many people from raising their own meat and if we can break down that barrier, I’m all for it.” Members of the public can now begin making reservations for 2017. Ecological and social responsibility sit at the core of the Osprey Hill philosophy. Unused parts of the bird – feathers, inedible organs – are composted on-site, while water from the processing facility is used to irrigate pasture. Lambs serve as lawn mowers on the fallow land. 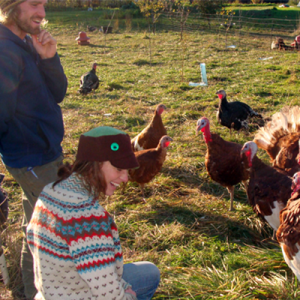 The core of Osprey Hill Farm’s mission is in transforming the way we produce food. Take their chickens, for example. Bought from a neighbor who breeds chicks, their journey as infants is a mere 20 minute car ride, as opposed to a plane ride from the Midwest like many farmed chicks. Some farms meet the bare minimum requirements for using the organic and free-range labels (about 2 square feet of space per bird, meaning I could keep 75 in my modestly sized bedroom). In contrast, Osprey Hill Farm keeps their hens outdoors (oddly this isn’t a requirement for “free range” or “cage-free” labeling) and gives them 40 times the space needed to be considered organic and free range. The chickens feel the grass under their feet. They see the sky. They peck and scratch. They have room to run. Sometimes too much room: a recent snow storm damaged a fence and most of the flock got out. All but a couple returned on their own, and at the time of writing this article, there is at least one rogue chicken still on the loose and laying eggs in Geoff’s toolbox. The values of the farm extend well outside the fence line as well, “until a few years ago, I was standing in line for food stamps,” Anna recounts. She now works to provide high-quality food for the people who are still in that line. She accepts EBT for her produce and serves areas like Eastern Whatcom County where stores that carry fresh produce are few and far between. She will even work directly with customers to find payment options for her Community Supported Agriculture (CSA) program, where the farm delivers weekly boxes of produce to drop sites such as Birchwood Elementary. Osprey Hill is also dedicated to helping new farmers learn the ropes and are mentors of our Food To Bank on Program. The farm evokes a feeling that words can’t begin to describe. It’s a feeling of significance; a vision of a better tomorrow. Anna welcomes you to experience this feeling for yourself: “If you really want to see how we do things, come out to the farm. There’s just no substitute for seeing it for yourself.” As you leave the farm and wind down the South Valley Highway, the snow-capped peaks of the Twin Sisters float majestically in the distance; you’ll understand as well. Learn more about Osprey Hill or Sign Up for Your CSA!